We all know how we love the Fall season, which also means Pumpkin EVERYWHERE! Our favorite treat for fall is the Pumpkin Spice Latte, but all those extra unnecessary calories and sugars (50g) is not a wise choice. 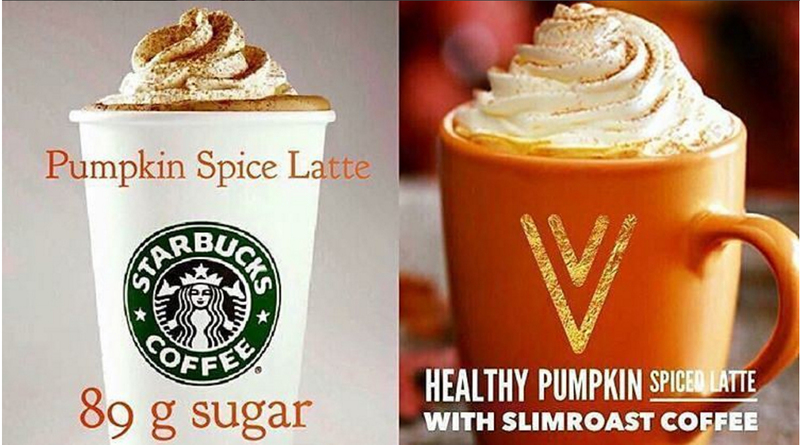 BUT we’ve found a skinny recipe for Pumpkin Spice Slim Roast that uses our Valentus Slim Roast Coffee. 6 oz. Slim Roast Coffee, 1 1/4 cup of milk, 4 TB pumpkin puree, 1/4 tsp. of pumpkin spice/vanilla extract each, 1 1/2 TB maple syrup, and 7 drops of stevia. Once you have your coffee ready, put in mixing glass and add your pumpkin, spices, vanilla extract, and maple syrup. Use an immersion blender to whip together. If you don’t have one, use a blender. Note: we played with the pumpkin and spice/vanilla extract ratios and while 1/8 tsp of the latter seems skimpy, we found it was just right. By adding more, you overwhelm the pumpkin flavor. Next, add your stevia to your 1 cup of milk and heat with your espresso maker. I like mine nice and frothy but do to your liking. If you don’t have a machine, you can put milk in a saucepan over a medium flame. Once the milk is simmering, remove and put in blender. Stir on high to create a nice foamy milk. Pour into a vessel and gently pound on the counter a few times. Let it sit for a minute and then use a spoon to separate the liquid from the foam of your milk. This will help you achieve the nice frothy top of a latte beverage. 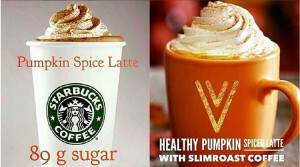 This entry was posted in Coffee Recipes and tagged Pumpkin Spice Latte, Recipes, Skinny Coffee Recipes, Slim Roast Coffee. Bookmark the permalink.